Hiya all. I have posted this request elsewhere but it seems to have been bypassed. I am in the throes of finishing my Webbit and have a couple of questions to help me along. Firstly, on testing the CoG I find that I am going to need 6.5oz of church roof. Is this excessive? Secondly, where the heck do I put it? Clean answers only thank you.Cheers my friends. That amount of weight is significant ,although i am sure most builders will say its ok .For test flying i always attach ballast using Velcro under the nose. Thanks for this Tom. With the Webbit the only place I think I can get it is in the motor bay, there is not much room in there but I can get a fair bit in there if I shape it. Cheers mate. Geoff. It might be worth considering extending the nose with some lite ply faced balsa block, would not take long to do,IMO 6oz is to much to add but even so the model is probably capable of performing ok with the the extra weight . Thanks for this Tom and Steve. I think I'm in for a rebuild. I am going to follow Steve's suggestion as this looks like the easiest and quickest way out. I'm a bit stuck for time before Greenacres but it will be done, maybe not maidened but definitely picture able. Cheers my friends. 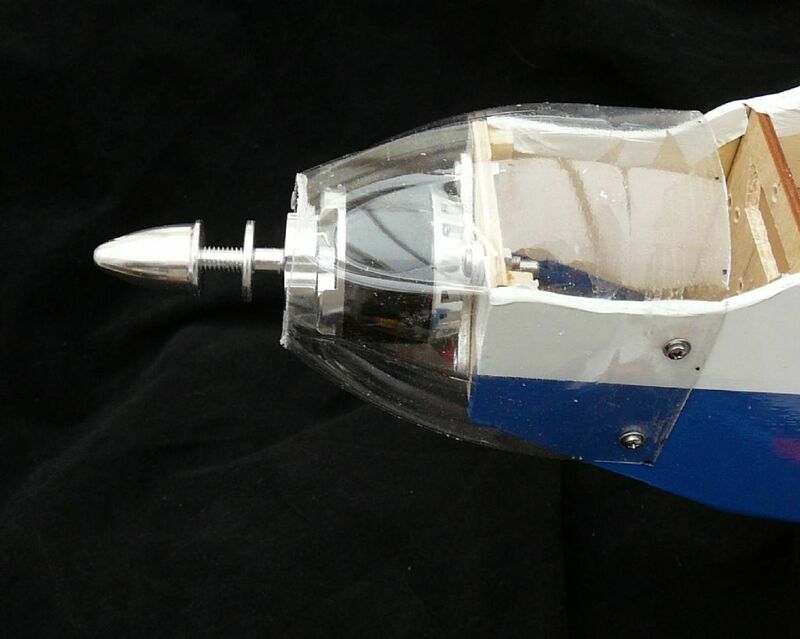 Not too much to do really, I glued a couple of pieces of hardwood between the front former and the fuselage sides, and the cowling was a Robinsons squash bottle which I sprayed blue on the inside, and stuck some white vinyl on the outside, held on with a couple of ss screws. The "windscreen" slides under the cowl, and has a magnet catch at the wing end. I have 6oz in my nose Geoff and it flies fine with it!! Its not excessive really!! ust stick it in and go for it!! 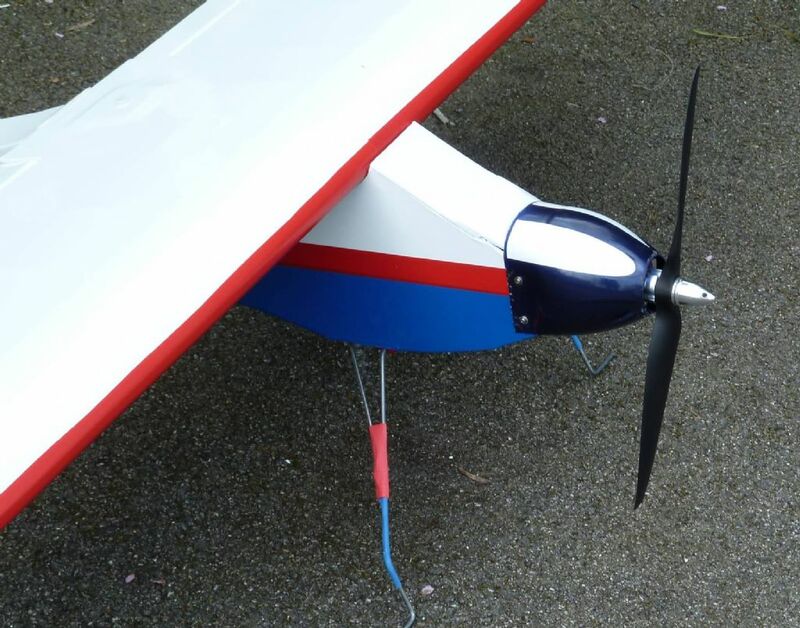 I use a 3000mah 3 cell Lipo in mine, would rather have a bit more duration than add cargo, there is plenty of room. But I did have the battery already so used what I had. Thanks for the replies gentlemen. I am in the throes of moving the motor to the front reinforced former, not very aesthetic I know but it will decrease the amount of ballast I need and give me somewhere to put the ballast I will need. Getting a bit panicky now 'cos tempis fugit and all that. Only got today to finish the alterations and cover the fuselage and do a bit of cosmetic work. Rich, I'm using a 2850mah 3 cell Lipo as well and I think this could be part of my problem, I've got it as far forward as I can so that's where it will have to stay. Cheers all. Have you got room to use a Rx battery instead of lead? top of the Lipo mount to help with CG. The ESC BEC is disabled by pulling out the red wire from the plug.